Welcome To The James Lee Suites! Thank you very much for your interest in the James Lee Suites. Built in 2002 on the site of the old Stoney Creek post office, we celebrated our 10th anniversary in September 2012. Our community includes 48 life lease units for adults 60+ over seven floors. Building amenities available to all residents include a fully accessible second floor terrace, a workshop, and first floor social room with seating for sixty and a full kitchen available for rent (by residents only) for family events. We truly are a community of like-minded neighbors and our goal is to make our home as friendly and welcoming as possible to residents and visitors. The lovely ladies of our social committee volunteer their time to plan parties (dinners, luncheons, barbeques, etc.) and weekly events such as cards, crafts and exercises. We also have some very kind men who volunteer to do building maintenance, and this helps us to keep our operating costs quite reasonable. 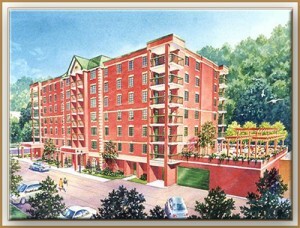 The James Lee Suites is operated by the Stoney Creek Health Association Residential Corporation, Phase II. Each resident of the building becomes a member of the Corporation upon purchase of a suite, and an elected resident Board of Directors runs the building on their behalf. Our location in downtown Stoney Creek is close to so many amenities that you will never be far from whatever you need whenever you need it. We are within walking distance to a medical centre, coffee shop, drugstore, post office, bank, churches, restaurants and bus stops. Please browse through our site and be sure to visit the section featuring currently available suites. If the information you’re looking for is not available online, please feel free to call or email us anytime and we would be happy to answer all of your questions. I’m so happy to live here. I love my suite and I would never want to live anywhere else. I recently moved in and am very happy here. I feel so safe, and everyone is very friendly. I especially like visiting with one of the dogs who lives here when he sits in the lobby with his owner and love to work on puzzles we have on the go in the party room. My husband and I were one of the first people to move in, and we were so happy to be able to live among so many of our friends. My wife and I love our home and this building so much. Our apartment is beautiful and just the right size for us, and we think of everyone here like family. I think everyone here is just great! This building is beautiful – so well maintained and kept up – and everyone is wonderful. My Mom has been so happy here, and I can’t wait for a big, bright corner apartment to come up for sale so my husband and I can move in! Moving into this building was a great choice for my Mom. She was the first resident to move in and has been so happy here. This building wouldn’t run nearly as well without all the hard work that Dennis and Ashleigh do. My husband and I love our balcony so much. As soon as spring weather gets here we spend hours everyday sitting outside. I love my big apartment and think that this place is great. My best memory is having a bunch of neighbours up to my apartment for a drink after one of our parties. We really enjoyed ourselves and talked together for a few hours.